Earlier this week, in a rare moment when I was not being woken up by my daughter or my son, I had a dream about my grandfather. It’s been almost 4 years since he died, of an aggressive lung cancer. It was against his wishes to have a memorial service, and I was away at the beach celebrating my last child-free birthday when a few of my family members scattered his ashes into Amazon Creek. 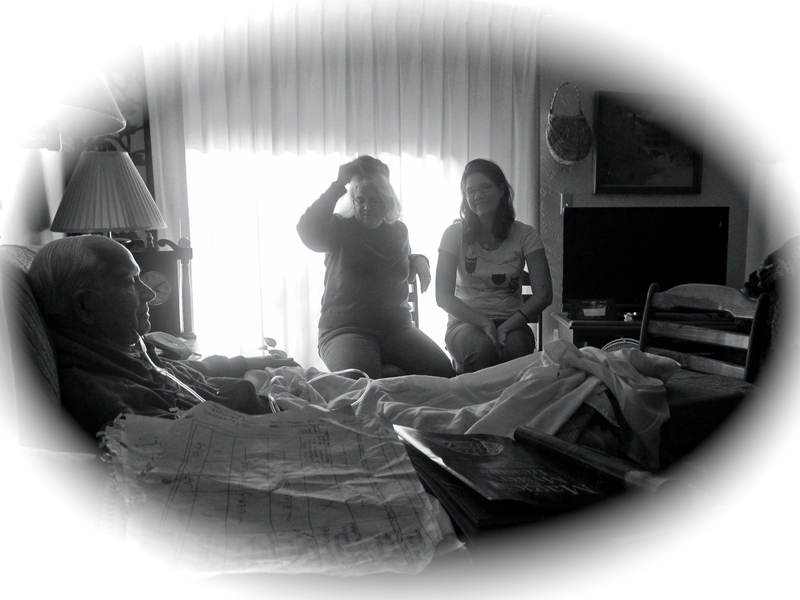 My mom and I visiting Papa Jack near the end of his life. My grandparents were never churchgoers when I knew them. Living most of their lives in the Bible Belt, they felt they didn’t fit in with church people. They were raised in church, and took their own children to church for a time. I’m not sure what my grandfather believed, but I certainly never heard him profess to be a Christian. In the months leading up to his death, I heard that some of my cousins in Kansas wanted, but were unable to, fly out to Oregon to lead him to Jesus. My mother said in his last days she spent hours holding his hand, reciting the 23rd Psalm and saying the name Jesus over and over. Anyway, I have very orthodox Christian beliefs. I believe in heaven and hell, but who goes where is a private matter between each person and God. God is inviting us all to heaven – we just have to say yes. I think there are plenty of people who claim to be Christians who haven’t really said yes to Jesus, and I think there are also people who don’t go to church or don’t talk much about religion who are on good terms with God. And who knows what might happen on someone’s deathbed. In my dream about my grandfather, he was still alive. I was surprised. “I thought you died!” I said. He explained that he was still alive, but he was just living in another place where I couldn’t visit him right now. “I’m with Jesus,” he told me joyfully. So we’ve been talking about mysteries. Questions that haven’t quite been answered by science. Bigfoot is a local mystery we’ve talked about. Most people don’t believe in Bigfoot, but a few people are really convinced. Dreams are a bit of a mystery too. Sometimes I’ve had precognitive dreams – I had a friend who was biking across America and I dreamed she was hurt. I found out later she’d broken her arm. I had some friends in Portland and I dreamed they were moving away – I knew it couldn’t be true because the husband was in the middle of a master’s program. Then we had them over for dinner and found out that in fact, he was dropping his program and they were about to move to Alabama. There was no reason I should have known about either of those events. So my dream about Papa Jack? Was it just my unconscious mind telling me what I wanted to hear? Or could it be something more? Well, it’s all a little bit of a mystery isn’t it? 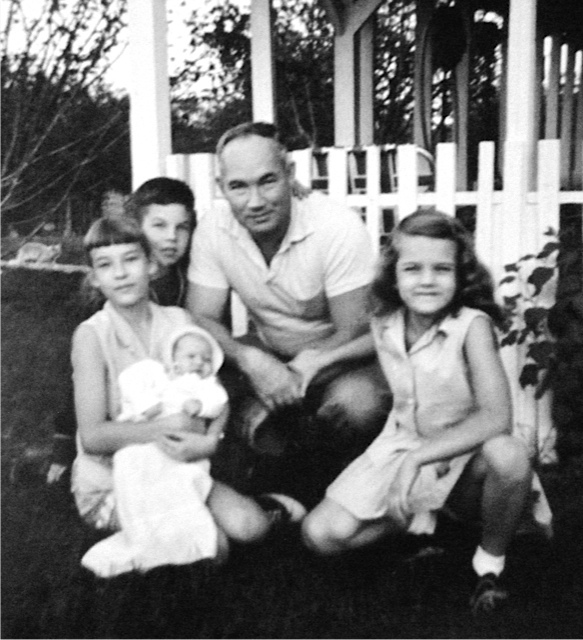 My grandfather with his first four children. That’s my mom on his right. 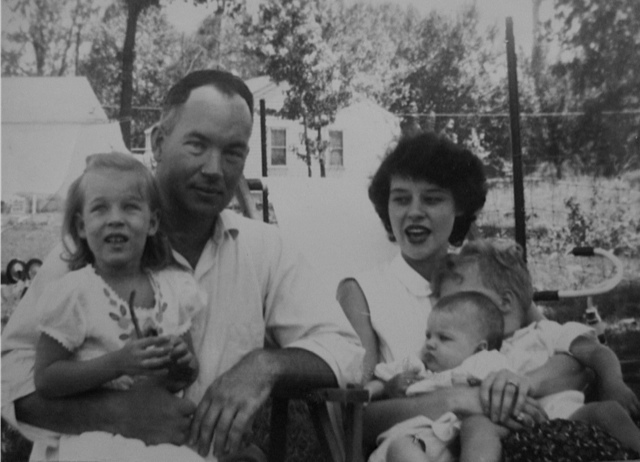 Papa Jack and Mama Anne with Aunt Cathy, Uncle Joe and my mom (the baby).